Marrying the best of Malaysian, Indonesian and Chinese cuisines, Nonya cooking is a tantalising mix of aromas, tang and spice. So you’ve made your way to a Peranakan restaurant for a meal but what to order? Peranakan or Nonya cuisine comes from who we know as the Peranakans, the descendants of early Chinese migrants who settled in Malaysia, Singapore and Indonesia. The Malay word “nonya” is a term of respect for women of prominent social standing (equal parts madame and aunty, if you will), has throughout the years, come to refer to the cuisine of the Peranakans. Nonya cooking is an amalgamation of Chinese with Malay and Indonesian cuisines, resulting in an exhilarating combination of all things tangy, spicy, herbal and aromatic. 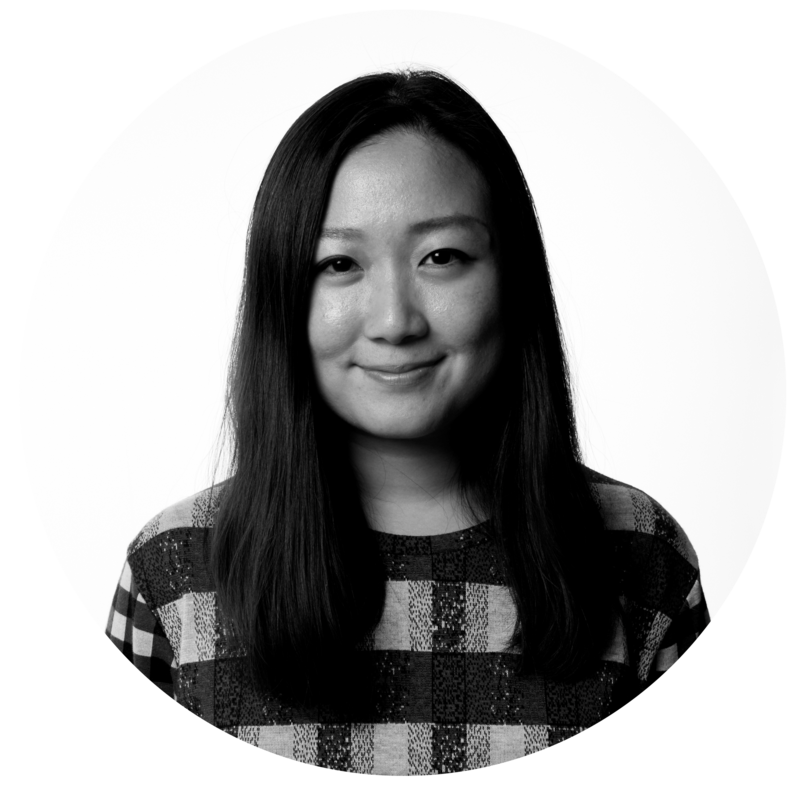 The Nonya menu is extensive and rather daunting for the uninitiated so we’re here to help you out. Here are five Peranakan dishes you should order for a taste of the cuisine. A quintessential Peranakan dish, the ayam buah keluak is unique for its use of the seeds of the kepayang, a tall tree native to the mangrove swamps of Malaysia and Indonesia. 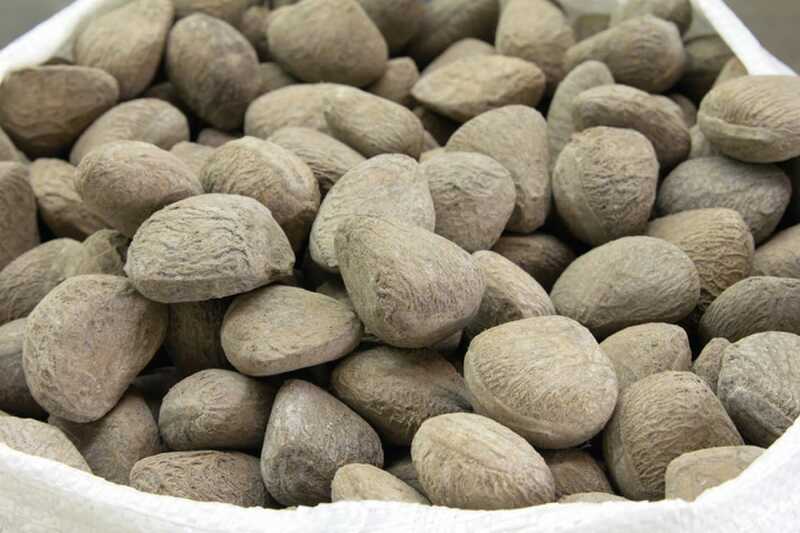 The seed itself is poisonous if uncooked as it contains hydrogen cyanide so it requires a great deal of prep before it can be ingested – the seeds are first boiled and then buried in ash, banana leaves and earth for more than a month; the fermentation process makes the cyanide easy to be cleaned. The chicken and kepayang seeds are then simmered for hours in a paste of tamarind and rempah. The result is piquant dish singing of spice, tang and a bitterness akin to good single origin dark chocolate. 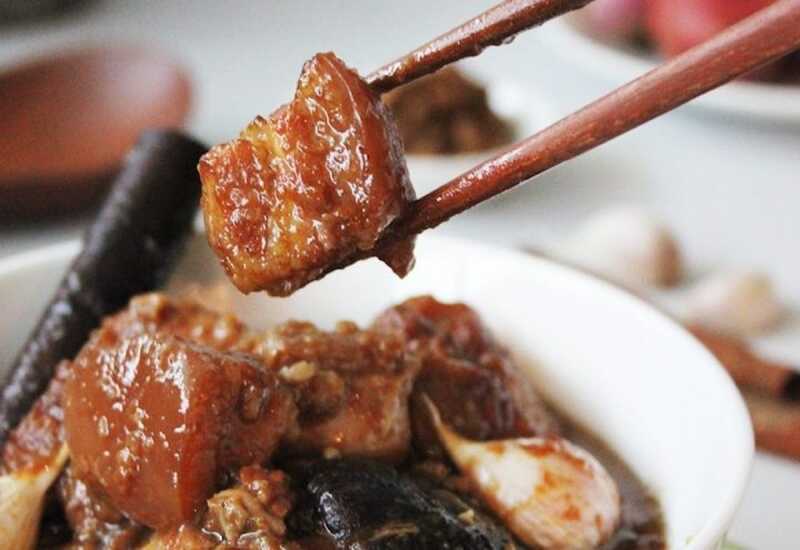 Usually prepared with pork trotters, belly or any part of the animal with a substantial amount of fat, babi pongteh is a braised pork dish cooked down with taucheo (read: preserved fermented soy bean paste) and gula melaka, a type of sugar that is so named for its roots in Malacca, Malaysia. Many Peranakan restaurants serve up the dish made with chicken too. You can expect a salty-sweet and beautifully funky dish that’s best eaten with a big bowl of steamed rice. 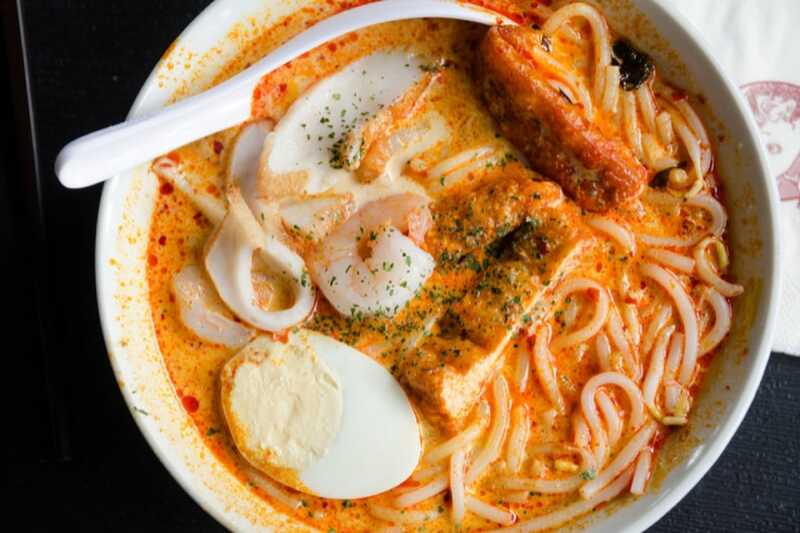 It’s one of our favourite Peranakan dishes for its two vastly different variations – laksa lemak, the version we are most familiar with as Singaporeans and the tangy assam laksa characteristic of Malaysia’s Peranakans. It’s a dish that witnesses how the influences from two countries (coconut milk from Indonesia and assam from Malaysia) can drastically switch up a simple bowl of noodles. Hokkien for “mixed vegetables”, chap chye is a simple stir-fried vegetable dish with its roots in Fujian province. It’s surprising how the mild-looking dish has managed to hold its own among the spicy, sharper flavours of Nonya cuisine. The secret is in its liberal use of taucheo and prawn stock. It is worth noting that every Peranakan household and restaurant worth its salt will have its own heavily-guarded chap chye recipe. If you see a kueh salat in a radioactive-looking green claiming to be all-natural, run. Today, the most natural way to get the green on the custard of a kueh salat is by blitzing up a lot of pandan leaves. Nonyas in the past relied on daun pandan suji, which are darker, smaller leaves reminiscent of pandan leaves. 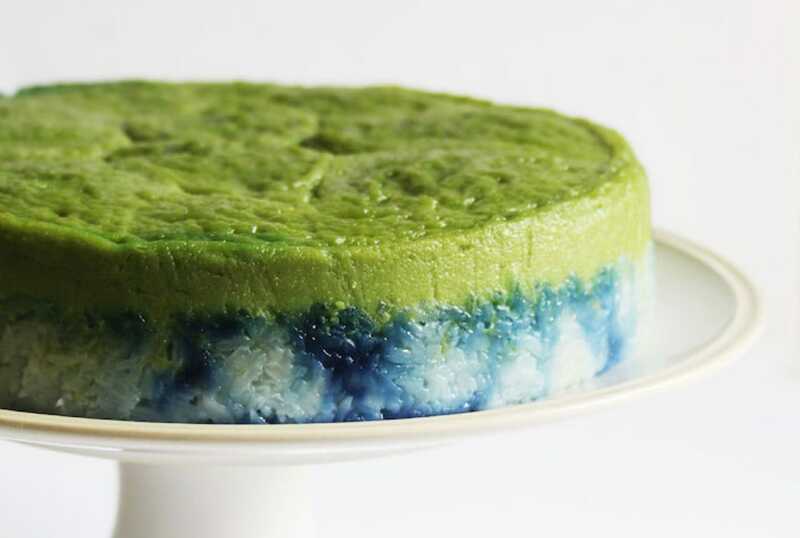 The natural blue in the rice layer comes from blue pea flowers, an ingredient commonly used in Peranakan cuisine for its pretty blue colouring. The final dessert is a creamy kaya custard paired with a slightly savoury glutinous rice base.